This easy, cheesy Sketch-Free Speedy Stovetop Mac and Cheese is made in record time without fillers, antibiotics, or mystery cheese sauce. Did you freak out over that title? Good! Because I’m freaking out too!!! Easy, cheesy, luscious, thick and creamy macaroni and cheese in just three minutes. THREE MINUTES! No microwave. No cheese powder. No sketchiness. Seriously though, this kit is everything right now. 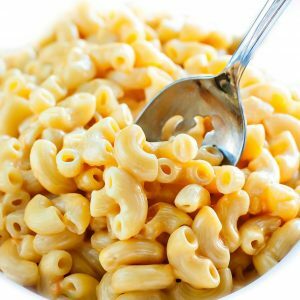 After trying my first Three Bridges Creamy Cheddar Macaroni & Cheese Kit, I literally jumped at the chance to partner with them for this post. Just because we’re all uber busy this time of year, doesn’t mean we have to settle for velveeta or cheese powder, ya know? The ingredients in each box are literally just cheese and fresh pasta. All you need to add is milk. I love that there is nothing artificial to worry about. No fillers, fake flavors or mystery cheese sauce – just the real deal! The fresh chilled pasta cooks up in record time (30 seconds whaaaaaa?!) and the shredded cheese is 100% free of any weird powders, silica, or antibiotics. Even grocery store shredded cheese can’t boast the same claim! It’s as close to freshly grated deliciousness as you can get. As for all the mommas out there, get excited! Your kiddos are sure to love this super speedy macaroni and cheese. Add their favorite mix-ins (we went with bacon and spinach – YUM!) or serve it up plain jane with a hearty side of veggies. Enjoy! Add 1/2 cup of milk to a medium pot and bring to a low simmer over medium-high heat, about 2 minutes. For an even dreamier, creamier mac and cheese, feel free to use half and half in place of the whole milk! I'm a huge fan of this method and the result is an ultra thick, ultra creamy sauce that rivals anything processed. Add the fresh shredded cheddar cheese and stir well until melted. Stir in Three Bridges macaroni until fully coated and bring to 165 degrees F, approx. 30 seconds at medium-high heat. Add fresh spinach and bacon on top or swirl it all together! Serve with a fresh salad for a balanced and delicious meal. I've gotten in the habit of making my own crunchy bacon crumbles for topping dishes with and keeping them wrapped in a small container in the fridge for the week. My toddler couldn't be happier with this LOL! If your making the bacon fresh for this recipe simply add 3 minutes to the cook time and you're good to go - easy peasy and still ready in under 10 minutes - YES! I typically alternate between using 2% milk or half and half with these tasty mac and cheese kits. The 2% by nature is a bit lighter, though still plenty cheese and saucy. The half and half is extra thick and indulgent. Choose your favorite and have fun with this easy, cheesy comfort food! 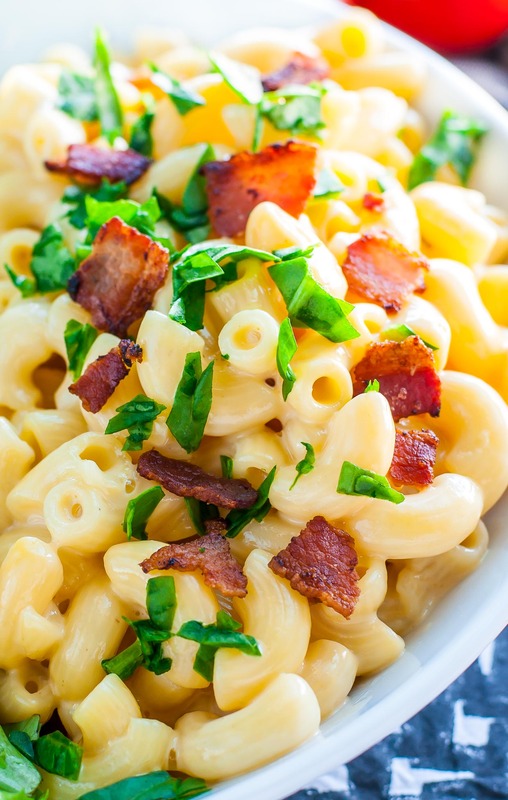 See post below for even more tasty mac and cheese topping ideas and mix-ins to rock your cheese-loving socks off! 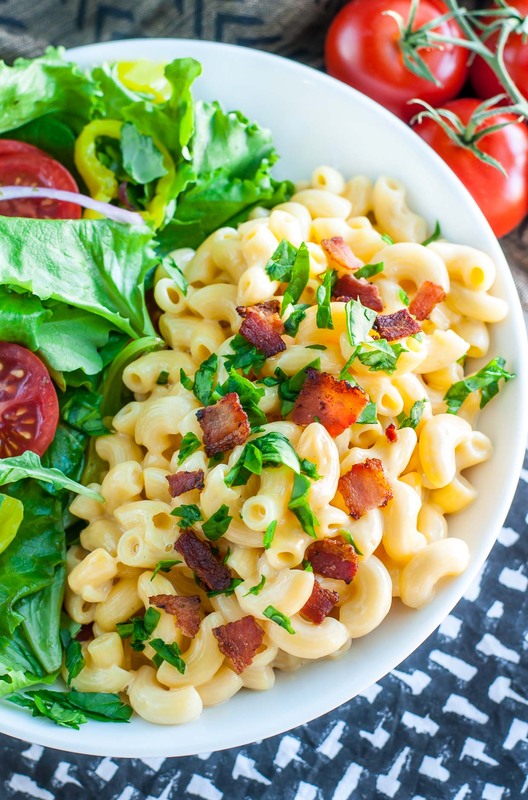 Round out yourSpeedy Stovetop Mac and Cheese with a fresh green salad! Simply empty your crisper drawer and dive in! Combine above ingredients in a small mason jar and shake until emulsified. Best when shaken vigorously vs stirred. Mix it – Top it – Love it! Empty the crisper mac and cheese – anything goes! 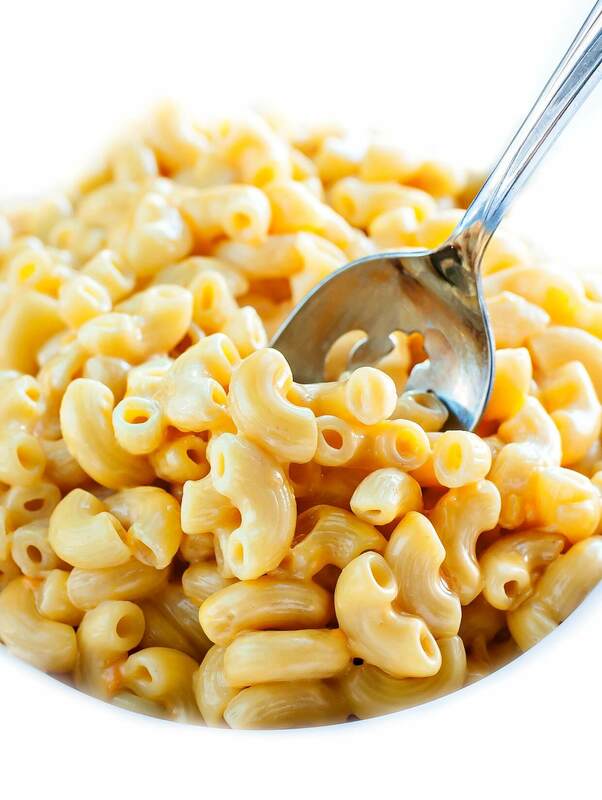 I can’t wait to see what y’all add to your all-natural Three Bridges Creamy Cheddar Macaroni & Cheese Kit! All you need are three minutes a 1/2 cup of milk. Game on! This recipe has been created in partnership with Three Bridges. To find a retailer near you, check out their handy dandy store locator or scope out your grocer’s chilled aisles near the refrigerated pasta. 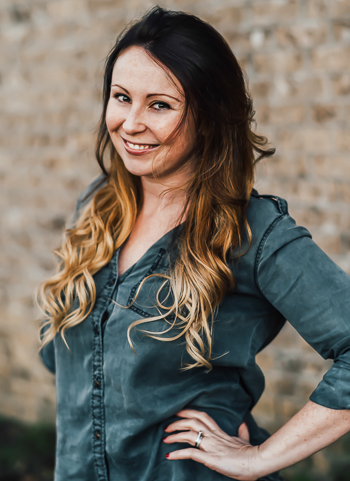 I cannot wait for you to try their clean, all natural, and sketch-free line of pastas and sauces! 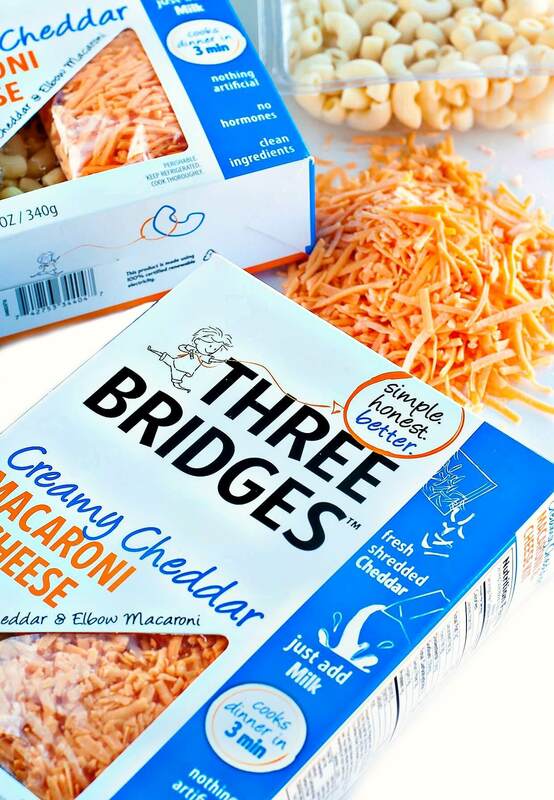 Oh my gosh, Three Bridges Macaroni & Cheese Kit………..what!!! I need this!!! YUM! I love this mac and cheese so much. This looks amazing! 3 minutes would be fantastic for mac and cheese! That’s amazing!!!! I’ve got to try this – I stopped buying boxed mac and cheese because of all the nastiness, but miss it’s convenience. Love how cheesy it looks! All the yumminess without any of that sketchy orange colored stuff- sign me up! LOVE a good homemade Mac recipe! It’s seriously so stinkin’ good! The best mac and cheese ever!! My kids will absolutely LOVE this!! Glad you’re loving it Katerina! 🙂 My tot does a little dance for it at the sight of the box 😉 and I love that it’s real ingredients in there! You can’t beat meals that can be made so quickly, and without any of the fillers, etc. And yes to bacon! That looks tasty! It’s so velvety and also love the included bacon & spinach. I’ll be consuming mac and cheese every night! I had no idea such a product existed!!! I never touch the boxes with the orange powder, but this is very tempting! Also going to share it with my college age daughter…time is always an issue for her and I worry she’s not eating healthfully. This would make her happy because it’s simple, quick, and delicious…and I’d be happy because it’s so much better for her! THANKS! That is way too convenient — I’ll be eating mac and cheese every night! My toddler would be 110% okay with that lol! Wow – those kits look really cool. I love that they have REAL cheese! I assume you have to keep them in the fridge, right? I have not seen anything like this in Canada, Toronto yet, but it’s a really great idea! Yup! Fridge kits! Hopefully they’ll be headed your way soon! Oh my cripes… My favorite carb of all time, made in 3 minutes?! Pinch me, because I think I’m dreaming! Right!? It almost seemed too good to be true and it. was. amazing!!!! The soft pasta adds just the right amount of starch to the cheese sauce so no flour is even needed for an ultra creamy cheese sauce – I’m obsessed! Good to see you like real food. We also look for no anti-antibiotics, no coloring nor flavor enhancers in our food. It’s a good way to be! 🙂 Thanks Mark!